The Balanced Scorecard is an organizational performance management methodology used to clarify and translate vision and strategy into action by incorporating financial, customer, internal process, and innovation perspectives. UCSD was the first university in the nation to adopt the Balanced Scorecard in 1993 and the first university in the world to be inducted into the Balanced Scorecard Hall of Fame. Developed by Norton and Kaplan at Harvard Business School, the model ensures that management considers many facets of operations while focusing on its vision and goals. Traditional quantitative measurements track only financial performance. Today, thousands of corporations and agencies worldwide use the Balanced Scorecard. What are the benefits of the Balanced Scorecard? Why do we need 4 perspectives? The Balanced Scorecard tracks activities in 4 main perspectives to give a more "balanced" evaluation of an organization's performance. How does UC San Diego use the Balanced Scorecard? Financial/ stakeholder perspective: This measures how we look to our resource providers through tools such as profit/ loss statements, balance sheets, and budget reports. Departments can use results to develop and implement revenue, cost saving, and budget strategies, create a risk management program, and establish internal controls. Internal process perspective: This measures our productivity and effectiveness through benchmarks comparing us with our peers in order to build best practices and internal controls. We have used past results to develop process improvement projects and cross-functional teams, and invest in new technology tools. Innovation & growth perspective: This measures how our employees feel through measures such as the Staff@Work survey conducted annually for staff in several Vice Chancellor areas. We have used past results to improve training and avenues of communication and enhance the quality of work/ life. Customer perspective: This measures how our customers see us through customer surveys conducted annually for staff, faculty, and students. We have used past results to facilitate communication with customers through various vehicles, develop solid and collaborative relationships, and foster positive relationships by ensuring staff are knowledgeable and well-trained. How does the Balanced Scorecard work with strategic planning? How does the Balanced Scorecard work with continuous improvement? 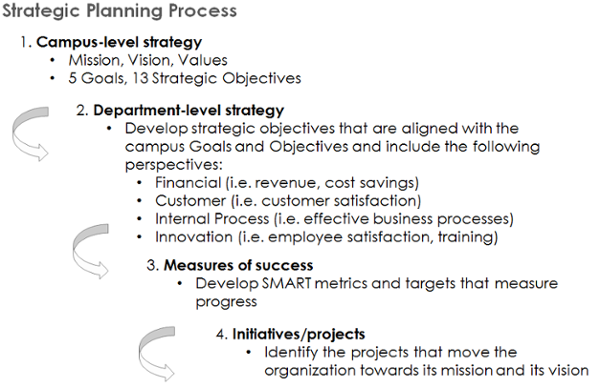 The Balanced Scorecard can be used in Continuous Improvement projects across campus to facilitate the implementation of UC San Diego’s strategic priorities.